Why do pogroms occur in some localities and not others? 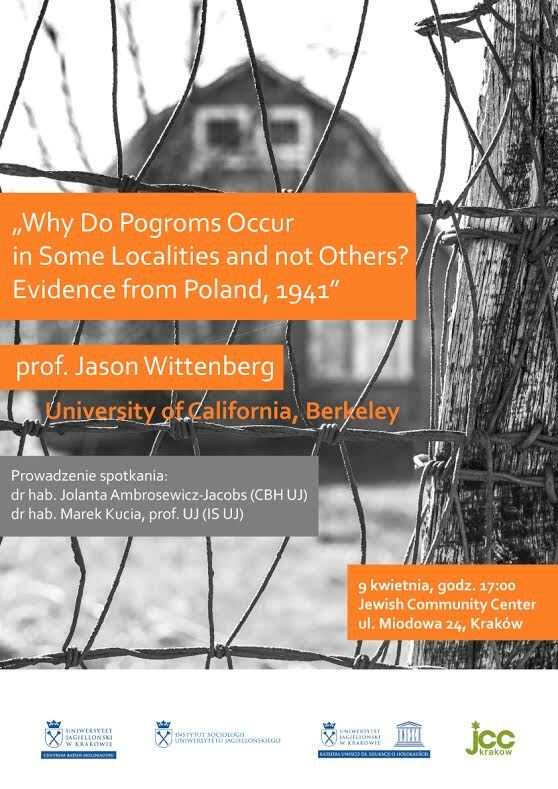 We investigate this question through a focus on a wave of pogroms in Poland’s eastern borderlands in summer, 1941. We find that some common explanations for why certain places got targeted– the presence of non-Jewish nationalist sympathies or Jewish communist sympathies– explain the pattern of pogroms less well than popular antipathy to Jewish nationalism. Prof. Jason Wittenberg is associate professor of political science at the University of California, Berkeley and a former Academy Scholar at Harvard University. His research interests include East European politics, ethnic and religious conflict, electoral behavior, and empirical methods. His book, Crucibles of Political Loyalty: Church Institutions and Electoral Continuity in Hungary, is the 2009 winner of the biennial Hubert Morken award for the best publication in political science dealing with religion and politics. His current book manuscript explains patterns of popular anti-Jewish violence.